Vaccine skeptic Andrew Wakefield is excited about Donald Trump’s presidency. 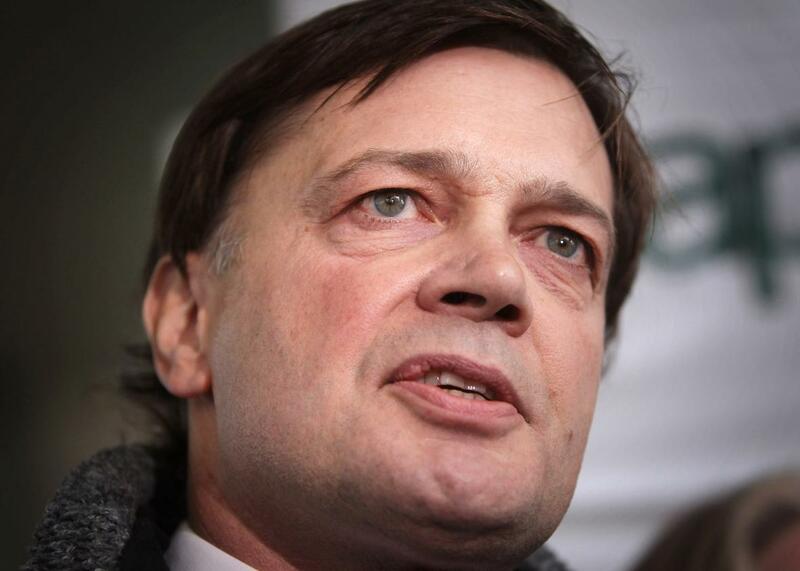 Andrew Wakefield talks to reporters in London on Jan. 28, 2010. They say you can judge a man by his friends. Donald Trump’s gaggle of pals and fans includes David Duke, Vladimir Putin, and Tom Brady. We can now add vaccine truther Andrew Wakefield to that list. Wakefield is the most notorious vaccine skeptic in the world, because his activism has been the most influential, which is to say, the most devastating to public health. In 1998, the gastroenterologist published a small study in the Lancet, a prominent British medical journal, that proposed a connection between autism and the measles, mumps, and rubella vaccine. Eventually, the paper was debunked, Wakefield’s medical license was revoked, and the Lancet retracted the paper on the grounds that key information had been falsified. But the damage had already been done. The spurious connection between vaccines and autism continues to suppress vaccination rates in many areas, leading to outbreaks of deadly and preventable diseases. Wakefield and his fellow-travelers are pariahs within the scientific community. But they seem to have found an ally in the president-elect. Wakefield and about 10 other vaccine skeptics met with Trump at a donor event in Florida in August. Jennifer Larson, the CEO of a Minnesota autism clinic, later wrote that he sat with them for 45 minutes and was “extremely educated on our issues.” Wakefield told STAT that at the meeting Trump said he had seen children of his employees diagnosed with autism shortly after receiving vaccines. Science’s Zack Kopplin first reported on the meeting earlier this month. It’s not just one meeting that has Wakefield and his cohort feeling so optimistic. Trump has a disturbingly robust history of musing about the supposed harm of vaccines. He has repeated a version of the story about his employees’ children in several venues, including a primary debate, and he tweeted his concerns about injection schedules. (At least the part of the tweet that said “Children are not tiny horses” was accurate.) “When I was growing up, autism wasn’t really a factor,” Trump told a reporter in Florida back in 2007. “And now all of a sudden, it’s an epidemic. Everybody has their theory. My theory, and I study it because I have young children, my theory is the shots.” It’s fair to say that Trump has demonstrated a more sustained interest in this “theory” than in just about any other issue of national importance. Trump’s power to impact vaccination policy is mercifully limited, though he could appoint a skeptic to head the Centers for Disease Control and Prevention, the National Institutes of Health, or the Food and Drug Administration. Wakefield told STAT that he has two priorities on the federal level as an activist. The first is to get Congress to repeal a law that limits vaccine injury lawsuits to a small list of recognized injuries. (The list does not currently include autism.) The second goal is to set up an independent board on vaccine safety. Many anti-vaxxers do not trust the CDC, which they accuse of being beholden to “big pharma” at best, and outright fraudulent at worst. Another vaccine skeptic wrote a blog post calling on Trump to “drain the swamp we call the CDC” and to nominate a surgeon general who believes vaccines cause autism. In the meantime, Wakefield remains hard at work promoting another cause: himself. His book about the Lancet debacle is being turned into a feature film. His anti-vaccine documentary, Vaxxed: From Cover-Up to Conspiracy, was accepted by the Tribeca Film Festival this year and then rejected after a huge public outcry from the scientific community. At the meeting in August, activists gave Trump a copy of the movie. He assured them he would watch it.